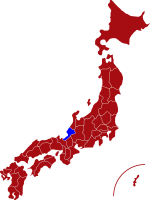 Japan is divided into 'areas' which are further divided into prefectures (roughly states or counties). Click on 'search by area' to be taken to a map of areas and prefectures from where you may narrow your search. To search by keyword simply add the words you are searching for e.g. Onsen and click the search icon. Look at our information pages to help you make a decision of where in Japan to visit and how to make the most out of your trip. The prefectures of Japan (roughly a state or a county) differ in terms of their climate, cuisine, customs etc. and to find out more choose the 'learn about the prefectures' options. To time your visit take in some of the festivals in Japan look at the 'events & festivals" page. The climate of Japan is an important factor to consider, if only in deciding what clothes to pack. See our 'climate & weather page'. Japanese baths and ryokan have a unique etiquette. To avoid embarrasement and to enjoy these unique featurs of Japan be sure to read the 'Japanese baths' and 'ryokan etiquette' pages. Because the guest houses we specialise are small, often family run, they do not offer immediate on-line booking. Often the guest houses will operate by phone and it is not easy to phone a Japanese guest house if you are not fluent in the language. This is where our system comes into its own. We handle all the contact with Japan and, thought this means that it takes a little longer to book (a day or two in most cases) you will get to stay at some of the smaller guest houses and get to see the real Japan. To see how the system works look at the 'step by step guide'. If you have made a booking through us you can access its details and manage some aspects of it unter 'manage my booking'. Boasting one of the country’s highest concentration of historically and culturally important sites, Fukui is home to Japan’s unique style of Soto-Zen Buddhism. Facing the Sea of Japan to the west and bordering Gifu Prefecture to the east, Fuku is a cultural heartland with many pleasant surprises just waiting to be discovered. Featuring miles of rocky coastline with a densely forests hills, this prefecture forms the western limit of the towering Tateyama Mountain range. Top of anyone’s itinerary should be the highly venerated Eihei-ji Temple of eternal peace. Home to the unique Soto-Zen sect of Buddhism, this 1000 year old temple is set deep inside an emerald green forest and presents one of the most spiritually rewarding places you are likely to find anywhere. On a completely different level is the excellent Fukui Dinosaur Museum where you can experience one of the best places of its kind in the world. Dedicated primarily to Dinosaur research, this museum boasts over 40 skeletons and countless exhibits with extensive English explanations. Further inland, Maruoka Castle is one of Japan oldest castles. Despite its relatively small size this structure is one of only twelve castles in the country to have survived the post feudal age with its main keep still intact. No Japanese experience would be complete without a visit to the Awara Hot Spring Resort. Opened in 2014, this complex features many traditional style hot springs along with many traditionally themed restaurants providing a refreshingly authentic homely atmosphere. There are also five footbaths ideal for anyone who doesn’t have time for the full Onsen experience. Once visiting Fukui you will soon realize that despite being one of Japan’s lesser known areas, this prefecture hosts a wealth of great surprises and is more than worth making the time and effort to come and see. For more information about Fukui prefecture, see their official tourism website. Air - The closest airport to Fukui is Komatsu Airport which takes under an hour to reach by train. Click here for its English website. The nearest international airport is Kansai Airport in Osaka. The journey time from the airport to Fukui by train is about three and a half hours via Shin-Osaka station. Click here for its English website. Rail - From Tokyo, Fukui can be reached in about 3.5 hours via the JR Tokaido Shinkansen, where you can transfer at Maibara for the JR Hokuriku Line. From Osaka, take the JR Kosei Line Limited express which takes about two hours. 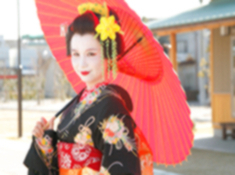 Awara Onsen is a popular hot spring resort located in the northern part of Fukui where visitors can enjoy authentic Geisha performances and also take part in a Geisha Makeover Experience. 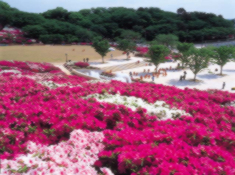 Nishiyama Park is an impressive park at any time of the year, but especially in April to see the 1,000 cherry blossoms and during May when the 50,000 azaleas are in full bloom. 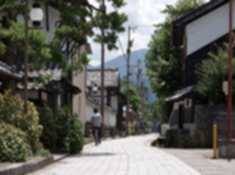 Teramachi Town is a picturesque former castle town often referred to as the "Little Kyoto" of the Hokuriku region. The town is full of beautifully preserved architecture dating back more than 400 years. 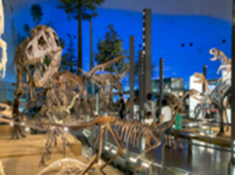 Dinosaur Museum is one of the top three dinosaur museums in the world with more than 40 different dinosaur fossils on display, including an impressive life-like Tyrannosaurus Rex waiting to greet visitors at the entrance.